April | 2011 | Small Farmers. Big Change. We’ve been talking a lot lately about the coffee market and what the current high prices mean for Equal Exchange, consumers, and our farmer partners. In this short video, courtesy of one of our Interfaith partners, Catholic Relief Services, you can hear the perspective of Pedro Ascensio, member and Marketing Coordinator of Las Colinas coffee co-operative in El Salvador. 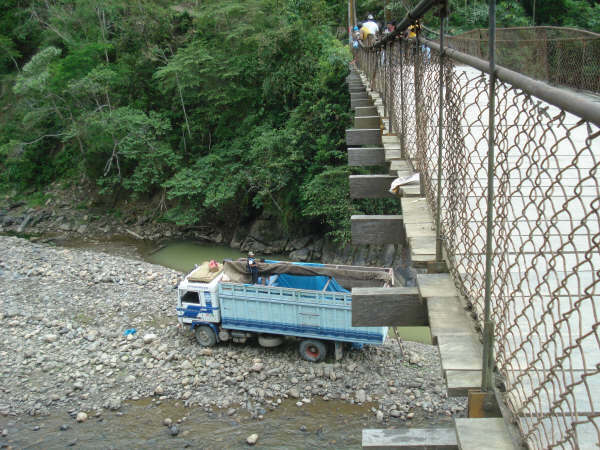 Equal Exchange has partnered with El Salvador for about fifteen years now. We have helped them pay off their agrarian reform debt (accrued in the 1980’s when a government program allowed coffee plantation workers to become owners of the land and manage the business as a co-operative), renovate their processing equipment, and convert their coffee to organic production. 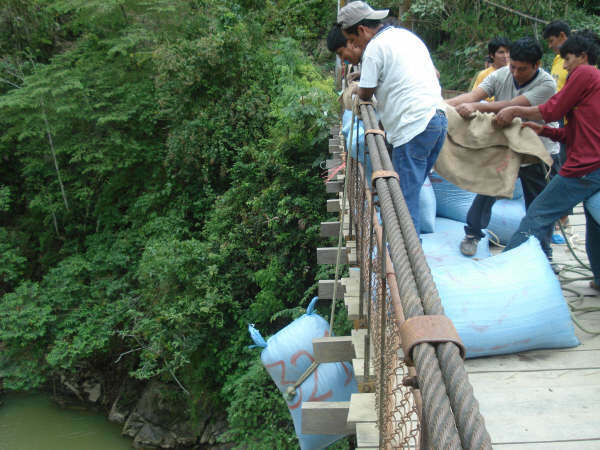 All of this has enabled the Las Colinas coffee co-op to protect their land, preserve an important watershed and the El Imposible National Park which they border, protect their health, gain higher prices for their coffee, and better provide for their families. Watch this 90-second video here. P.S. We’re drinking Organic Las Colinas here at Equal Exchange today. Try some, as well as our new supply of Cafe Salvador! And you thought your job was hard? In my nine years at Equal Exchange, I’ve had the opportunity to travel to many far-off and isolated regions to visit our farmer co-op trading partners. I can say with certainty that the small farmer coffee co-operative, CECOVASA (The Organization of Agrarian Coffee Cooperatives of the Sandia Valleys) in southeastern Peru, is situated in one of the most stunningly beautiful and exceptionally remote areas I have yet to experience. 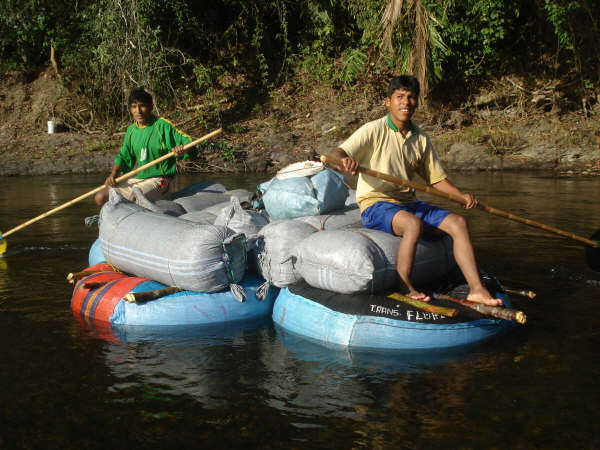 Close to the Bolivian border, and near the protected Bahuaja Sonene National Park and the Tambopata-Candamo Nature Reserve, the 5000 farmers that comprise CECOVASA have a challenging situation finding sustainable ways to generate income, feed their families, and develop their communities. All of that was just to get us to the small town of Puno where CECOVASA has their regional office. From there, we visited each of the eight primary level co-operatives of mostly Quechuan and Aymara indigenous peoples: each of those co-ops is located another two to six hours from Puno. And I’m very sure that they chose not to take me to visit the most remote of the communities. Harvesting high-quality, organic coffee is never an easy way for small farmers to make a living – under any circumstances. But for some co-operatives, the particulars of their geographical, topographical, and ecological conditions pose even greater challenges. If you don’t believe me, click HERE and see what I mean. These 20 photos will tell the story better than I ever could! Keep in mind that these PHOTOS only show you one of the many sets of tasks (getting coffee from the farms to the mill to be processed) involved in producing, processing, and exporting coffee before it even gets to the United States. Once at Equal Exchange, the coffee still needs to be roasted, blended perhaps, packaged, and delivered to stores, churches, restaurants, cafes, and consumers. These days you can find coffee from CECOVASA in our Organic Peruvian, Organic French Roast, Organic Love Buzz, and Organic Mind, Body and Soul blends. Enjoy the coffee! Let us know what you think. And remember, in the words of John Lennon… you know, it ain’t easy. One of the best explanations of the rising cost of specialty coffee is simply the economics of supply and demand. At a time when demand for specialty coffee is growing, global production is failing to keep up, which has led to higher prices. However, exacerbating that situation and leading, in many cases, to a net decrease in production are the impacts of global climate change and very real changes in weather patterns. Specialty coffee, like many crops, requires certain conditions to thrive; ideally cool and stable temperatures between 60-75 degrees, an altitude between 3,000-6,000 feet, and clearly defined wet and dry seasons. A typical, or “ideal” cycle would include somewhere between 60-100 inches of rain over a nine-month rainy season, at the beginning of which the plants flower, pollinate and begin to develop cherries; and a three-month dry season, during which the cherries ripen and are harvested. Of course, agriculture is an inexact science; some regions have two harvests, but still follow an abbreviated period of wet and dry. For the most part, across the vast swath of coffee-producing nations, farmers have enjoyed stable weather patterns and seasonalities. Of course, there have been exceptions; years when a single frost destroyed almost all the Brazilian crop; then too, international prices rose dramatically. That reality was echoed in recent New York Times article, “Heat Damages Colombia Coffee, Raising Prices” which blames high temperatures and heavy rainfall- 25% above average in the last few years- as the primary causes of the drastic decrease in production. Production in 2010 was 25% lower than in 2006. One farm they cited saw a 70% decrease in their 2010 harvest. The farmers of KNCU, our partner in Tanzania, have relied on glacial melt from Mount Kilimanjaro for drinking water, and crop irrigation since 1933. However, higher temperatures in recent years have depleted the glaciers; the regional “reservoirs”. Not only are higher temperatures diminishing crop yields, but the declining water table is affecting farmers’ ability to irrigate their crops. Yields in the past years continue to decline, seriously impacting farmers’ incomes and economic development of the region. The problem is not limited to coffee. Equal Exchange has been collaborating with our rooibos tea partners to mitigate the effects of climate change in Southern Africa. For the past few years, the farmers have been experiencing severe impacts from drought and higher temperatures, felt most acutely in the drier parts of the Kalahari where they farm. The delicate soil and water conditions in this area are being exacerbated by increasingly warmer temperatures. Rainfall patterns have also changed and the rooibos farm plots have suffered from high levels of degradation and mortality. These vulnerable lands have been affected by wind and water erosion, which threatens not only the livelihoods of the farmers, but also the long-term production of the lands. As the world’s largest producer of greenhouse gases, it’s hard not to feel we Americans are somewhat responsible for the plight farmers are facing, and for declining yields. In that sense, paying higher prices for coffee doesn’t seem so unreasonable. And complaining about it- which I am wont to do- seems perfectly unreasonable, compared to what the producers are facing. If current trends continue, it will only get harder to source specialty coffee- there may not be coffee to purchase. The real question, for me, is are we doing enough? The future of coffee, and of millions of small-famers, depends on it. On a brighter note, the farmers and co-ops we work with are deeply committed to facing climate change head-on. We are working with groups around the world to develop new methods of sustainable coffee production and agriculture in general. From reforestation projects in Nicaragua, and soil fertility in Mexico, organic fertilizer in Peru and Ecuador, we are working with farmer co-ops to not just expand production, but to do it better, and more efficiently. The continued support of Equal Exchange and our customers is ensuring sustainable and high-quality coffee for years to come. To learn more about the rising price of coffee and the state of the coffee market, visit our website. The price of coffee, like many other commodities (oil, sugar, and cacao for example) is sky-rocketing. While there are real supply issues in the market that are contributing to coffee prices being at their highest point in 14 years, one of the biggest factors behind rising coffee prices is actually being caused by speculation in the commodity market. And speculators, running amok in a system we dislike to begin with, are easy to blame. But understanding what is actually happening is more complex. Essentially traders are assuming that prices will continue to increase in the future, and so are buying up green beans and coffee contracts, to sell at a later date. As less supply and fewer contracts become available, speculators are creating a self-fulfilling prophesy… to their great advantage. The pre-cursors to commodity markets were established in the United States in the mid-19th century. They were designed to manage risk for producers and consumers, and ease the intensity of market fluctuations. Commodity markets actually served as a useful tool in measuring demand and ensuring supply. “C-Markets” were essentially markets where buyers and sellers could negotiate contracts for future sales. Farmer X will deliver a certain amount of, say, wheat, to Buyer Y, on a specific date, at an agreed-upon price. The farmer knows how much money he will receive and how much to produce. The buyer knows what he will pay and how much he can expect to receive. Previously, farmers had to estimate the market’s “demand” for a certain crop, and produce accordingly. Inevitably, human error and variable growing conditions led to shortages, when prices spiked, and over-production, when prices tanked; farmers lost money, and crops rotted. In its simplest iteration, speculation occurs because contracts are based in part on current market conditions (how much wheat is available, and how much it’s selling for on the “cash market”), but also on expectations of market conditions in the future. That is to say, supply of and demand for a certain good can change over time- due to weather, changes in technology, population growth… which affects the price. If you believe you can predict changes in supply or demand, you might be able to take advantage of that to turn a profit. A wheat farmer might negotiate a commodity contract at the current market price- say it’s $5/bushel, with the terms of one month. Over the course of that month, there is a freak hail storm in Iowa, national wheat production is down 20%. A month later, people are willing to pay $6 for a bushel of wheat because it’s harder to come by. The farmer has technically just lost $1; since he is required to deliver the wheat to the buyer at the agreed-upon price of $5. The buyer, in this scenario, say it’s a bakery, would have “made” $1, in that the current going rate for wheat is $6, but he got his for $5, and his cost of goods are lower than his competitors who didn’t buy their wheat on the commodity market. The problem with today’s commodity markets is that the “actors” are rarely producers or consumers; they aren’t farmers and bakeries. The buyers and sellers are traders who have little or no interest in the good they’re trading, other than making a profit. They are essentially gamblers, who spend their days analyzing weather patterns, production trends, and potential shifts in demand. This can, and often does, have the affect of distorting or intensifying market trends. If wheat production starts to decline (and thus, so does supply), commodity brokers will buy up contracts, assuming that prices will increase. In turn this drives prices up even higher, as the “supply” of contracts goes down, and there is less wheat available for purchase in the market. In contrast, if early indicators say the wheat crop in Iowa looks excellent, traders might “sell” their wheat futures (contracts) in anticipation of prices going down- which results in lower prices before the Iowa harvest occurs. The C-market for coffee is much like any other good. Exporters from producing countries sell contracts to deliver a certain quantity of green coffee on a certain date. Certified “Exchanges” grade and store the coffee in certified warehouses, as assurance to the buyer. The coffee, once it enters the warehouse, is essentially indistinguishable from any other “lot”. Normally, the commodity market “works” in the sense that it helps regulate prices. As demand has risen in the past few decades, the C-market price has risen, and (at least theoretically) farmers have planted more coffee. Recently however, coffee production has peaked. Speculators continue to buy and sell contracts; but it’s becoming harder and harder to expand production to meet growing demand. Global warming and changing weather patterns have resulted in lower yields per hectare; which requires more and more land under cultivation just to maintain previous yields. At the same time, the average age of coffee farmers continues to increase, as younger generations are leaving the countryside to search for jobs in cities, leaving less labor to invest in new lands or crops. A real decrease in supply is made exponentially worse by the speculators; who see only the opportunity in the decreasing coffee production. To make matters worse (for the C-market, anyway), more and more consumers are interested in higher quality coffee, and in specific varietal coffees- Colombian Excelso’s or Tanzanian AA’s- and they are willing to pay more for them. Since those coffees are not traded on the commodity market (where all the coffee is indistinguishable), more and more quality coffee is being traded outside the system, and at slightly higher prices. This had led to a perceived decrease in supply- there are fewer coffee contracts on the C-market because people are trading directly- on top of a real decrease in supply. All of which continues to drive up prices. What is especially frustrating for Equal Exchange, is how much of our work is designed to avoid the commodity market, and distorting affects like speculation. Our very mission is to connect consumers with producers, and circumvent the anonymity, unpredictability and downright inhumanity of the C-market. We purchase specific lots of coffee, directly from farmers. We constantly strive to know our partners, put a face to their products, and commit to long-term relationships with them. And despite our best efforts to escape the whims of the C-Market, we find ourselves struggling with its implications. 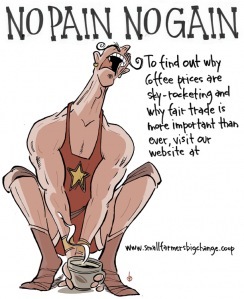 As demand for specialty coffees has increased, even non-Fair Trade buyers have been forced to pay well-above the minimum price (which floats up so that it never be below the C-Market Price), and Fair Traders like Equal Exchange pay even more still. At a time when the C-Market price is just under $3/lb, it adds upward pressure on prices for legitimate traders (like Equal Exchange) who actually roast and market the coffee, as opposed to just selling contracts for a profit. At the end of the day, it seems likely the Commodity Market will “correct” itself at some point. It has happened in the past that prices have risen dramatically, only to fall to record lows thereafter. Farmers who have enjoyed record prices for their coffee over the past few years, will be left with whatever prices the market dictates; those that are not organized in Fair Trade co-operatives, or who have left those co-operatives thinking they can reach the “golden land” on their own, will be further at risk. That’s the nature of the Commodity Market- there is no room for relationships or human consideration. At that point, it will be traders like Equal Exchange who have strong relationships with Fair Trade co-ops on the ground in producing countries, who will continue to struggle to achieve their goal of fair prices for quality coffee, bringing our customers the best value we can provide. Want to wake up and start your day right? Fresh eggs from your local farmer? Scrumptious bread from your local bakery? Luscious freshly roasted coffee from small farmer co-operatives? And … dairy products… you guessed it … from local, small family farmers? Wake up on the right side of the bed: eat a healthy breakfast AND do your part to help build a better food system by supporting co-operative businesses, small farmers, and local producers. P6 Co-operatives are living their principles by taking action to help their members and other consumers get into the game. 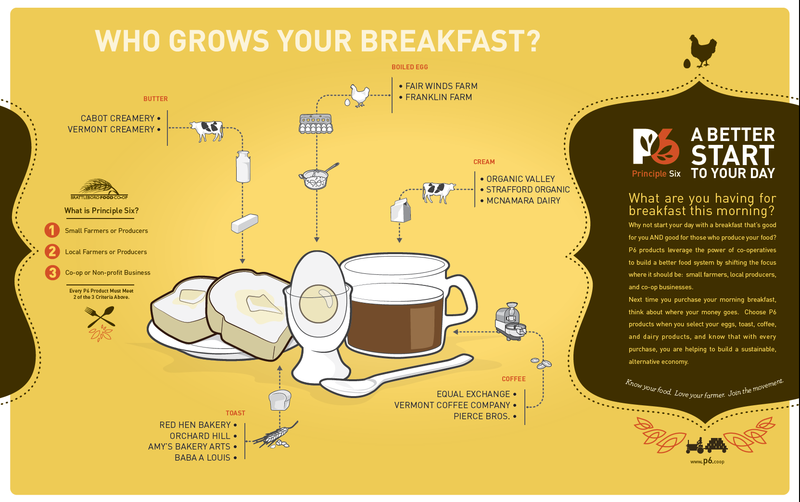 If you live near Davis Food Co-operative in California, Brattleboro Food Co-operative in Vermont, the Merc in Lawrence, Kansas, Willy Street Co-operative, in Madison, Wisconsin or Seward Community Co-operative in Minneapolis, Minnesota, click on the P6 Breakfast Infographic from the list below to find a list of those folks who produce your breakfast food. Check out the infographic, buy from P6 producers, and join the movement to build an alternative economy and a more sustainable food system. Of course, even if you don’t live near one of these food co-operatives, you can still do your part by choosing to buy products from small farmers, local producers, and co-operative/non-profit businesses. Look for additional Principle Six Co-operatives later this year! For more information about the Principle Six Co-operative Trade Movement, click here.